Allaire’s Mission Statement: Allaire Village Inc., a 503(c)3 is a non-profit organization. Its mission is to recreate the 19th century life and times of James P. Allaire. We strive to energize current and future generations in their understanding of history, through education and preservation. 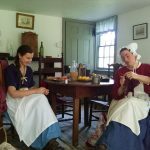 The Historic Village at Allaire is a non-profit living history museum that runs primarily on the service and dedication of our many historical interpreter volunteers. Our volunteers are active in a variety of areas throughout the village. 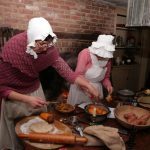 Interpreters are stationed in the residences and trade shops to engage visitors in conversations regarding life in 1836. The volunteers are the faces of Allaire and represent our mission to the public. Below is a description of the roles and expectations that are a part of being an Allaire Volunteer. Friendly and respectful to all visitors, Allaire staff and volunteers. 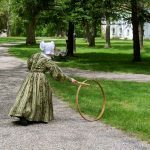 Dressed in early 19th century period attire, provided by AVI or made by volunteer (must be approved by Volunteer Coordinator). 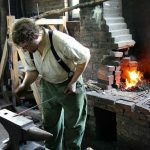 Welcoming visitors and interpreting the history of the Howell Iron Works and the life of James P. Allaire. 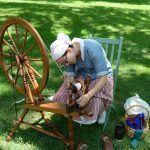 Demonstrating a trade or skill that is associated with the 19th century to the public. Flexible and adaptable to changes made in events, programs and policies. Actively volunteering for a minimum of 15 hours or more per year. 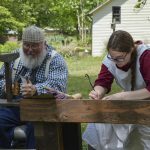 Becoming an Allaire Volunteer is an excellent opportunity for people of all ages to learn new skills and connect with the community. 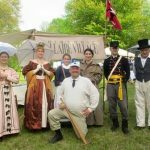 Allaire Volunteers are not expected to enter the volunteer program with a complete knowledge of the 19th century. 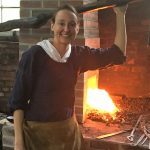 Instead they will be trained by Allaire’s volunteers and craftsmen to become an informed interpreter and experienced in any or all of the trades listed below. For more information about volunteering, or to register as a volunteer, please fill out the volunteer form below and a member of our team will get back to you.